We offer K-12th grade, adult, and multigenerational Residency Workshops which are a 1 hour minimum duration per day and generally are offered as a multiple-week workshop series. Each workshop meets grade-level appropriate Common Core standards in Visual Art & Science. We customize all workshops to fit the needs of each group and can also create workshops based on a particular theme or material. Workshop fees vary according to the selected workshop, duration, and the number of participants. Please complete our PROGRAM REQUEST FORM if you would like to set up a Residency Workshop at your site. Wolves, owls, and bears, oh my! In this workshop residency, students will learn about the creatures and plants that live in a local ecosystem. Crafted from discarded materials, the flora and fauna created will become an on-site installation of the habitat. (Grades K-12 & Adults, Multiple Sessions, Min. 3.0 hrs.) *A 2.0 hr. workshop is also available. Participants will enliven their senses as they embark on personal journeys through school, home, and their communities. Through tactile experiences and experimental mixed media projects, they will map familiar environments in unexpected ways. (Grades K-12 & Adults, Multiple sessions. Min. 6.0 hrs.) *A 2.0 hr. workshop is also available. Students will investigate their surroundings and make connections about the landscape, manmade world, and community. Experimenting with sketching, paper-making, and collage they will create a collaborative large-scale interlocking paper “quilt”. The final piece, which represents the essence of the surrounding environment, will be crafted out of handmade recycled paper created from natural and discarded materials. During this program we will investigate the obvious and more hidden elements of our natural and manmade world. We will tap into our creativity as we reduce-reuse-recycle while making unique eco-art. Possible projects include making paper, puzzles, lanterns, mobiles, itsy bitsy beings, and more! In this sweet and savory workshop series, students will become paper craft chefs! They will learn about different food cultures and discover techniques for sculpting paper into appetizers, entrees, desserts, and more! The program will culminate in a full course meal with students serving their creations to the other participants. Score, cut, fold and sew to create your own handcrafted artistic journals and books using unique papers, found imagery, and packaging. Discover the hidden potential of discarded books, explore unusual formats, and learn traditional and contemporary binding techniques. 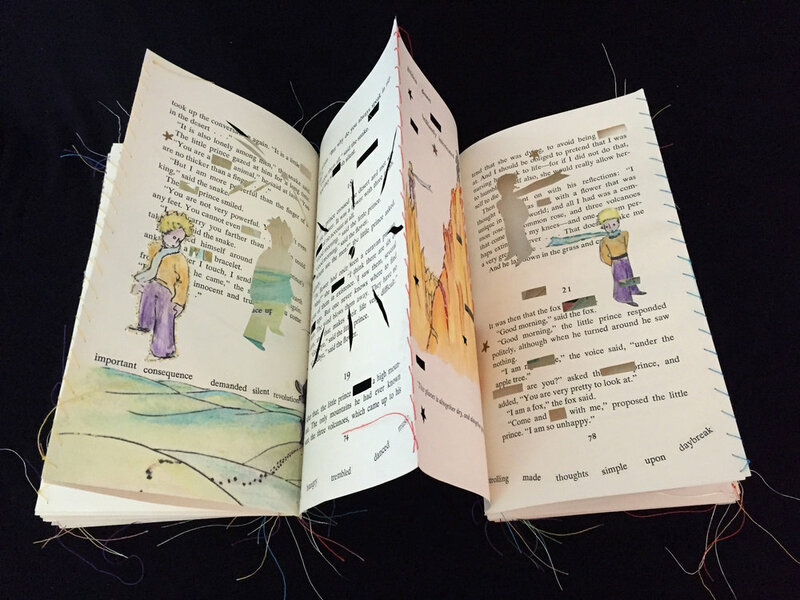 This mixed media workshop series will expand your idea of what a book can be! In this teacher training series, participants will learn about sustainable art practices and develop related creative skills through hands-on making, brainstorms, and feedback sessions. They will design their own creative reuse curriculum and learn best practices for sharing these programs in their communities. Please complete our PROGRAM REQUEST FORM if you would like to set up a Multi-Class Residency Workshop.